Rugged Book transforms your tablet into a go-anywhere, do-everything device. If you play as hard as you work, and work as hard as you play, you need a device that can keep up with you, on any surface, in any environment. Rugged Protection - We call it “rugged” for a reason. With four layers of stainless steel, polycarbonate and rubber, Rugged Book protects your device from impact and corner damage and can withstand falls up to 6.6 feet. Drops happen, but damage doesn’t have to. Bluetooth Capability - Rugged Book pairs with tablet, phone, or other device quickly and easily. No wires to get in your way, freeing you up to work anywhere, anytime. Rechargeable Battery - You’re not good when you’re running on empty, and neither is your tablet. Rugged Book’s rechargeable battery keeps you typing up to two years between charges. The sleep-wake function helps preserve battery life when the keyboard is not in use. Multiple Viewing Angles - Rugged Book’s sturdy adjustable cradle hinge holds your device securely at multiple viewing angles perfect for typing, reading, or just watching a movie or facetiming with friends. 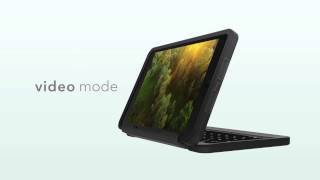 Detachable Case - The Rugged Book case detaches from the keyboard which allows you to place your device on one surface and still type with the keyboard on another. The detachable case also lets you function in four modes: book, keyboard, case, and video. Laptop-Style Keys - The ability to take your device anywhere doesn’t mean much if you can’t work comfortably when you get there. Laptop-style keys make typing easy, and you can even type in lowlight conditions, thanks to the backlighting feature—available in seven colors—which can be adjusted to three brightness levels. Dimensions: 9.84" x 7.20" x 1.10"
My son has dyslexia and was recommended to get a keyboard ASAP. So many on the market have very little protection for the iPad. This one provides great protection and is very easy to use in all forms. He has had no trouble working the keyboard. The lights are not too distracting either. It has turned the iPad into a mini computer. His friends are jealous! My son is 8 and gives the case a good workout. Good product delivered in 3 days to Perth.